Another Orphan Care season has come to an end. As with last year’s the numbers show an increase over the year before. An evaluation of species and numbers will follow after brooders and other equipment are cleaned and neatly stored for the next onslaught of orphans. What needs to be shouted out, loud and clear, is that all of those orphans not to mention the regular patients that arrived were cared for by a compassionate and skilled bunch of people. Without these dedicated volunteers and staff, thousands of animals would be left to languish basically coming into trouble through no fault of their own. That is why we are here….for the creatures and for you. And, as we leave one busy season behind we catapult into the next busy season…our educational and fund raising programming. Last Friday night, Laura Hackett and her team of concessionaires pulled off our first third Friday of the month movie night. It was a big success and a lot of fun. It was part of the culmination of our month of owls. The feature was Legend of the Guardian, Owls of the Ga’Hool. It kept the attendees focused on the charming owl characters except for the trip to the concession stand or to see up close a few real owls. The evening was lovely and the amphitheater was festooned with lawn chairs, blankies and little people. The culmination of our month of owls will be our Sunday Speaker Series special, which explores owls in the mystical, mythology, legends and literature. Check our web page or Facebook page for details. This is an innovative look at a charismatic creature…the Owl. Finally, for now, I want to mention our upcoming Wishes for Wildlife, our 25th offering of this big fundraising event….but this year all things are different. It will be held at our facility, the Rob and Melani Walton Campus of Liberty Wildlife. Not only is the venue different, but the activities will be different also. There will still be opportunities to buy, compete for, or buy treasures beyond the pale. There will be divine dining opportunities…and a truly great program. 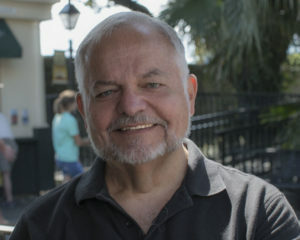 Chris Parish of The Peregrine Fund will speak, the Legacy Award will be awarded, and there will be a “special treat” for those who attend….just sayin’…you will have to be present to find out. There are still tickets remaining. Go on line to www.libertywildlife.org,/events/wishesforwildlife to find out specific information or e mail me at megan@libertywildlife.org. I want to thank all of our Orphan Care Volunteers and Staff; I want to thank all of our Movie Night attendees; I want to thank in advance all of you who sign up to come to this year’s, October 20, Wishes for Wildlife. The intake total for the year is now up to 8650. The intake window has slowed dramatically in the last few weeks. My thanks to all the dedicated volunteers who kept showing up and accepting the injured and orphaned creatures that find their way to our door. Many apologies for being so “non-specific” in getting the blog updated this past month. My hip surgery was a little more invasive than I was expecting and I have not been at the facility to get any recent pictures. 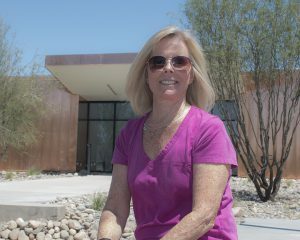 A couple of volunteers have submitted photos and for that I am supremely grateful. I hope to return to my duties in the near future, but until then, here is a brief update on what has been taking place. There are about 2,000 species of bats in the world (almost a quarter of the total mammal population). 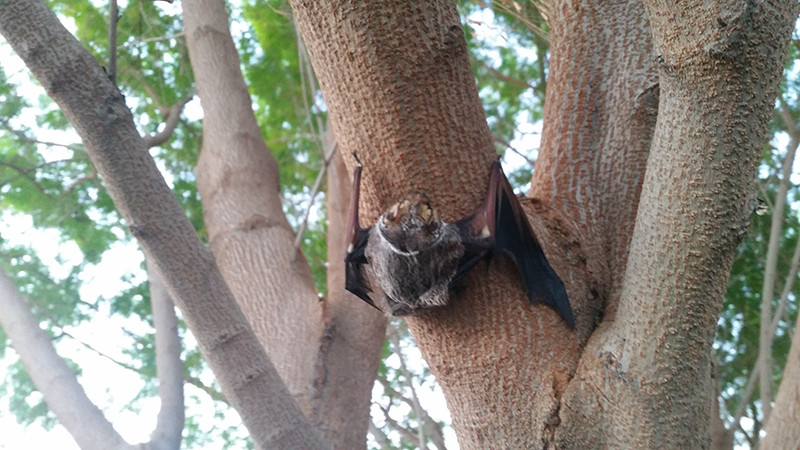 This little guy was sleeping in a tree in the neighborhood which is what hoary bats do during the day. The property owner’s cat knocked it off of it’s perch and it then was brought to Liberty. An assessment by the Med Services volunteers turned up no apparent injuries so it was released in fairly short order. Important safety tip: If you come across any type of bat in the wild, never touch it without gloves or other safety equipment. If they come in contact with a human, they will be euthanized and tested for rabies as a matter of protocol. 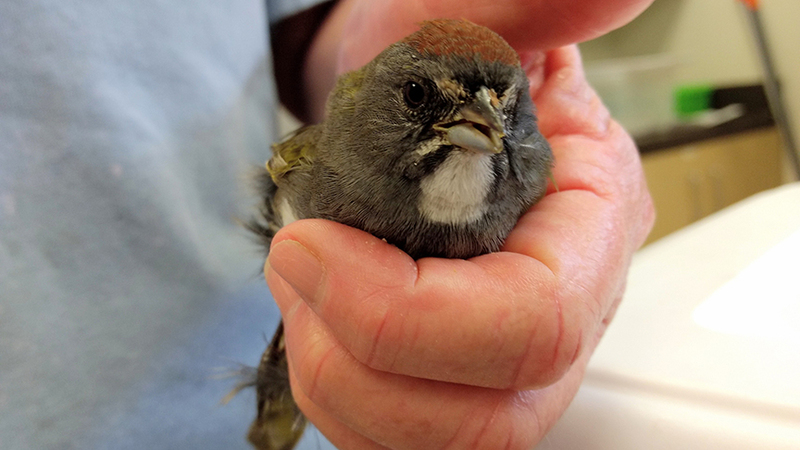 This pretty green tailed towhee came in recently. The green-tailed towhee is the smallest towhee, but is still one of the larger members of the American Sparrow family. Its breeding range covers most of the interior Western United States, with a winter range in Mexico and the southern edge of the Southwestern United States. 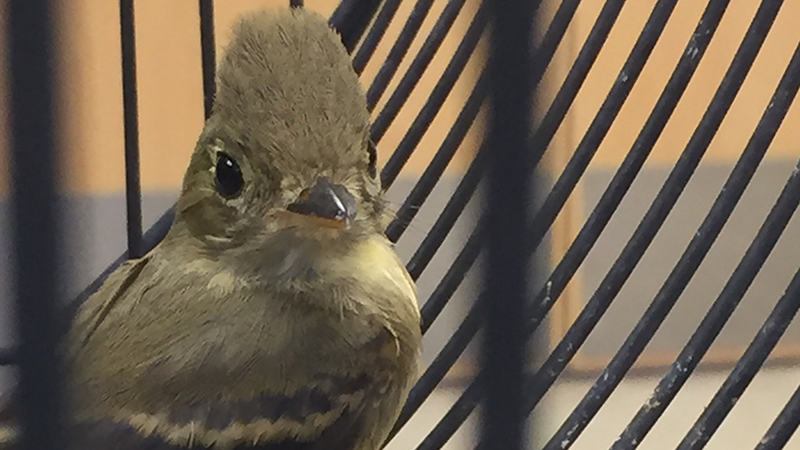 This bird can be recognized by the bright green stripes on the edge of its wings. It has a distinct white throat and a rufous cap. It measures 7.25 in (18.4 cm) long and weighs 29 g (1.0 oz). It is fairly tame, but often stays hidden under a bush. It is fairly common in habitats with sagebrush and other such bushes. It is uncommonly seen because of its tendency to stay under cover. 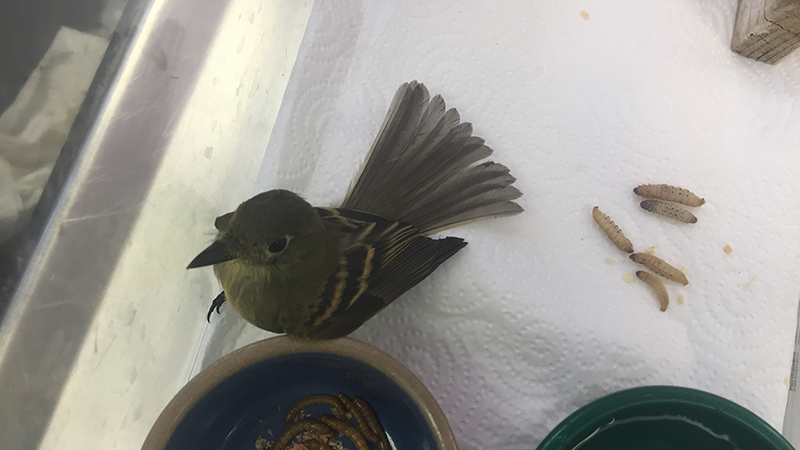 I’ve had to rely on other volunteers for pictures during my medical “outage” and luckily, one of the great window volunteers, Patti Sennette sent in these shots of this little flycatcher – AND the little owl. Thank you, Patti! I’m guessing this guy made it into Orphan Care before they closed for the season! 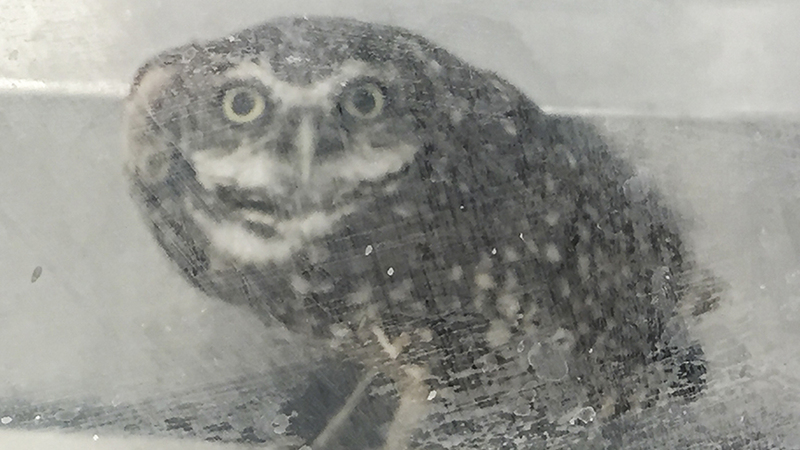 As I understand it, this little burrowing owl was tying to get into a local i-Hop restaurant (must like pancakes!) 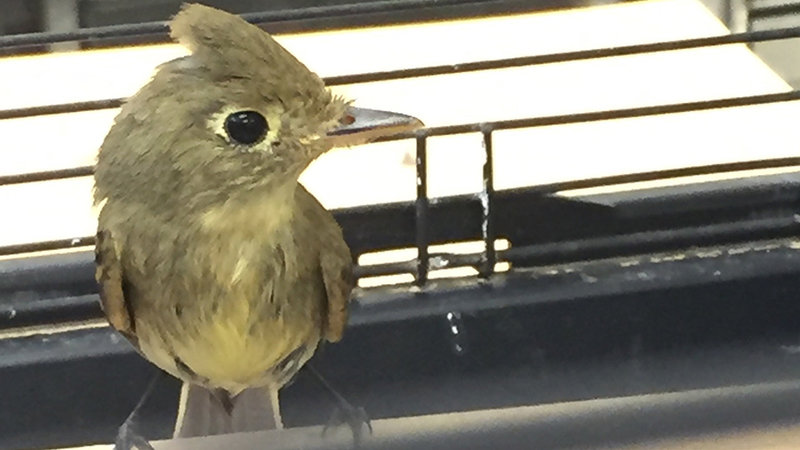 He was rescued and taken to Liberty and is now in our care. Our Education Department has begun a series of “Movie Nights” at Liberty. Family films are shown one a large screen in the amphitheater for fee (pop corn and soft drinks are sold!) 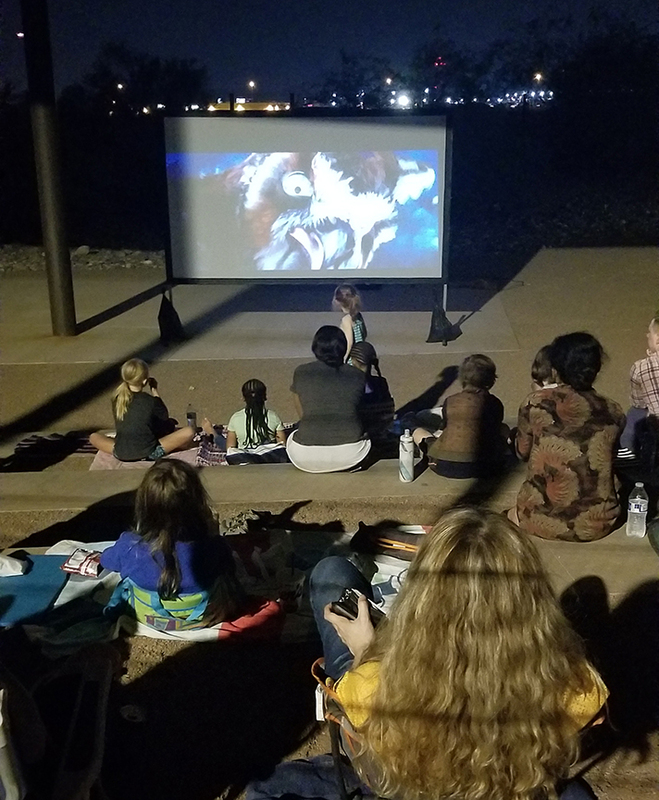 The first movie shown was “Legend of the Guardians – the Owls of Ga’Hoole.” It appears to have been a big hit by all who attended! The next film is being scheduled as we speak and we’ll have a flyer out as soon as it is firmed up.